What do Indian food and Muslim traditions have in common? I know close to nothing about either...that's what! Sure, ask me about Mexican food and you're bound to get a quick response. Ask me about Indian food...then bask in the uncomfortable silence well, silent except for the crickets in my brain...chirping away. I am all set to remedy that situation, because I am nothing, if not an eager student. I love learning about different cultures, religions, beliefs, countries and the food and people that go along with them. There were a few motivating factors behind todays post. One being that we've been eating a lot more veggies on a regualr basis at home than we used to. On purpose. I decided for all of us that we were going to eat more mindfully...the majority of the time. So, we've been eating a lot less meat. Not that we stopped liking meat...but, since I am no longer working on a regular basis, meat is more of an occasional meal contribution now. As Michael Pollan suggests, we treat it more as a garnish. Another factor being that I'm really enjoying the book Real Food Has Curves lately. Great tips, great references, delicious recipes...Biryani being one. And yet another motivator being that I happened upon an event over at Taste of Pearl City that asks for submissions of recipes that can be eaten during Ramadhan, a month-long Muslim holiday. When describing Ramadhan, Umm says "Ramadhan is the month, where muslims fast from dawn to dusk without food or water. This fast is obligatory on all adult muslims - men & women - unless exempted. Hijri is the Islamic calender which starts commemorating the year when Prophet Muhammed (SAW) immigrated from Mecca to Medina with his companions. Iftar is the event where muslims break the fast at the end of the fasting day at dusk. Normally we break the fast with few dates, juice, porridge but after that we have a meal which will be based on different ethnicity. So this meal can include rice, pasta, bread, noodles, roti's , curries etc." Well, okay then...I'm always up for new adventures...and everything just sort of came together as the inspiration and driving force behind me trying something new. Okay then...Biryani. According to Wikipedia, Biryani (or Biryanibiriani, beriani, بریانی) "is a set of rice-based foods made with spices, rice (usually basmati) and meat, fish, eggs or vegetables. The name is derived from the Persian word beryā(n) (بریان) which means fried or roasted." Muslim travelers & merchants were supposedly responsible to introducing Biryani to India. Pretty fitting to learn that my reasoning all comes together, just so. Mix rice & water in medium pot; bring to simmer over med-high heat, stirring occasionally. Cover the pot, reduce heat to very low, and simmer slowly until rice is tender, ~35 mins. Set pot aside, off heat, while you prepare rest. Position a rack in center of oven and preheat to 350 degrees F.
Heat a large saucepan over medium heat. Add the sesame oil, then add the onion, tomato, garlic, and ginger. Cook until the onion has begun to soften & tomato breaks down, ~5 mins., stirring occasionally. Stir in veggies, garam masala, cinnamon, and salt. Stir over heat until quite aromatic, ~5 mins. Stir in yogurt and lemon juice. Cover the pot, reduce heat to low, and simmer slowly until veggies have begun to break down, ~20 mins, stirring occasionally. Stir in nuts & raisins and set pot aside, off heat. Spread half the rice in bottom of a 9" square baking dish. Pour all veggie mixture on top; spread evenly to corners. 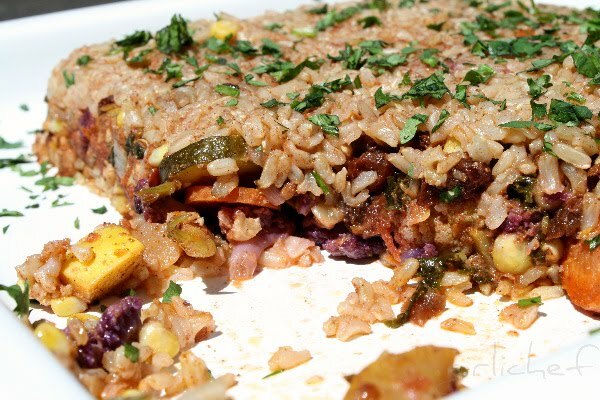 Top the dish with remaining rice, again spreading it evenly across the baking dish. Cover with aluminum foil and bake 15 minutes. Let stand, covered, for 5 minutes. Preheat broiler and place rack ~6" from heat source. Spread melted butter over casserole and set under broiler just until rice begins to get a little crisp. Set aside at room temp for 5 minutes before turning whole thing upside down onto serving platter. I wish there was a way to crisp the rice on what ends up being the top...well, if you have a torch, you probably could. Sprinkle with chopped cilantro. Fortunately, I have a very well-stocked spice cabinet...and although Garam Masala wasn't included in it before...it is now!! I made my own using the method given in the book. I had everything I needed; I just had to grind up the coriander seed, allspice, and cardamom (after extracting the seeds, ugh). Well worth it...just made sure to make extra so I could jar it up and save it for future uses! 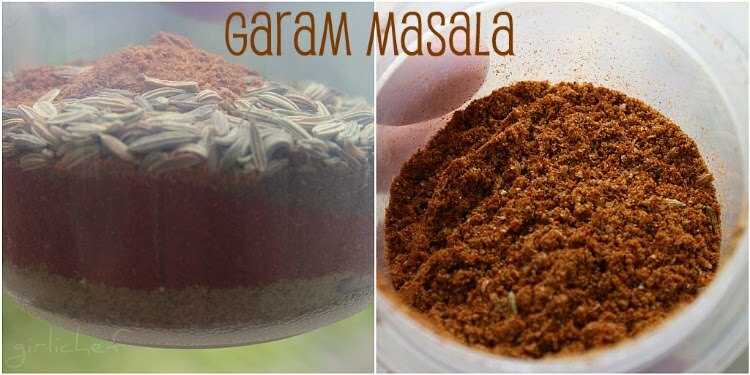 Mix together: 1 part ground allspice, 1 part cayenne, 2 parts fennel seeds, 4 parts mild paprika, 4 parts ground cumin, 4 parts ground cardamom, and 8 parts ground coriander. Wait. There are Indian curries. I've made them... I'm totally NOT rewriting this post. I'll just say, I'm not completely unfamiliar with Indian food...I adore Indian curries...it's all the rest I'm pretty unfamiliar with. Aw I love purple cauliflower and you don't get it here anymore. I need to incorporate other cuisines into my daily life more often Heather. This would be a great start. I love chicken biryani, so I have to give this a try! Thank you so much for sending it to my event. I want this for lunch, and will now suffer cravings until I fix it myself! It all looks really good and too like to try different cuisines. This certainly has a good mix of vegetables and is healthy too! Thanks! Love biryani! This version looks like a winner! I love that I learn so much from your posts'. I love that your pictures are so beautiful. I love Michael Pollan's ideas on eating and food in general, and how it should arrive to out plates. I love vegetables. And the fact that you plan on using your super skills to make special dishes featuring them is a double love. All of the flavors in this dish are so exciting. I bet this was delicious! Biryani is one of my favorite indian dishes! Like you I know so very little about how to cook Indian cuisine...even though I really do love it. Fantastic post and delicious recipe. OMG I've never had Biryani and it looks incredible!!! Totally going to try. Especially since it's veggie! Looks lovely and beautiful pictures. I have been wanting to read that book. ;-) Very interesting post--the stories, traditions, etc., behind food are always so fascinating and it is fun to try new foods. I love biryani dishes--this one looks delicious and full of health. I just love Indian food but have yet to try a biryani. Yours looks so incredibly scrumptious and as a bonus, oh so healthy!! Yum! I can smell that garam masala. Great looking Biriyani.. Indian party meal is not complete without Biriyani.. I'm with you...I love learning about all kinds of cultures, traditions, foods, etc. Haven't heard of this book yet and I am a fan of both authors so I will have to check it out. 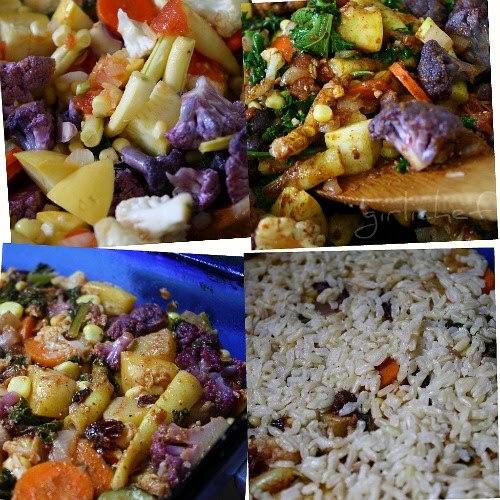 I'm loving that purple cauliflower in your biriyani. It looks like a delicious meal! Have you dug into the Real Food Has Curves blog? Mark and Bruce post some great recipes! This sounds like a good recipe to use the fruits of our gardens. lol I'm trying to get myself to eat more veg. This might be a good way! Looks super tasty! 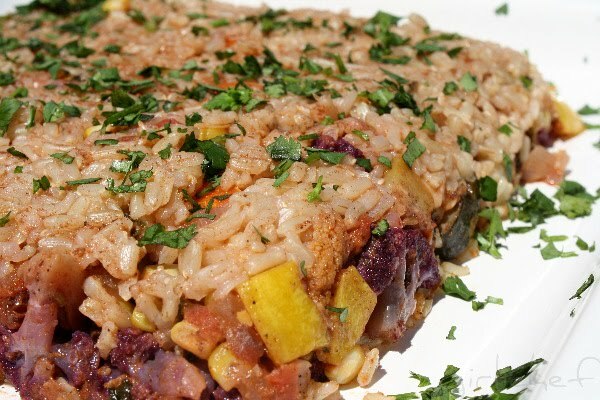 What a delicious way to incorporate more veggies into our diet. Great post, thanks. Cricket chirping in your head? Too funny. I have a client that is Indian and she has threated to cook for me many times. She's from the vegetarian side of the country and one of these days I'm going to enjoy her cuisine and of course will blog about it. Great post. Biryani is just packed with so many flavors - a great addition to anyone's recipe collection. Yours is - as usual - just delectable looking. And less meat is good for all. Garam marsala is such a wonderful versatile spice! 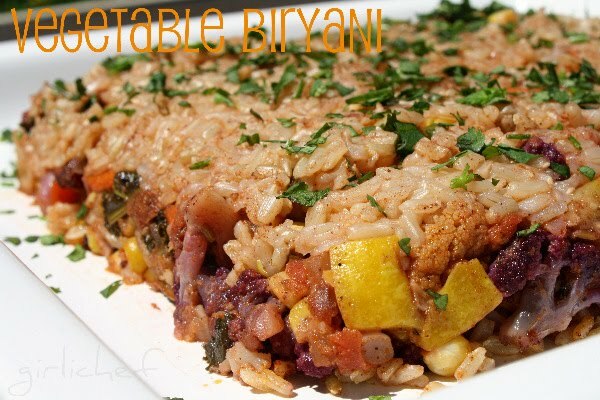 I adore vegetable biryani for the delicious combination of nutritious grains and veggies. This is a great summer dish! This looks SOOOOO good! I am actually making Chicken Biryani tonight...great minds think alike, HAHAHA! Looks amazing.. I am getting so hungry. Really tasty way to get a verity of foods into one dish.